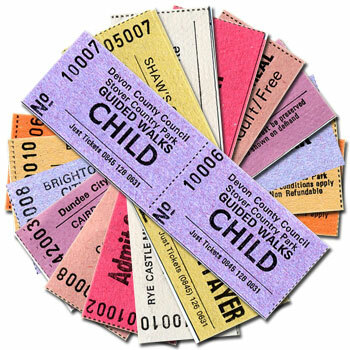 First or Fourth stubs can be cut away to form a 2 or 3 part ticket. 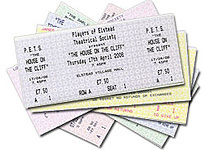 Standard 4 part ticket 75mm depth x 165mm width with 17 lines in regular computer text. Ticket unit cost includes graphics/logos from our in-house library or of your own supply. 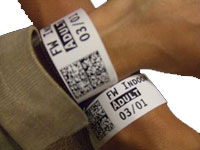 Tyvek and PVC Wristbands - Secure Admission and Control ID Wristbands. 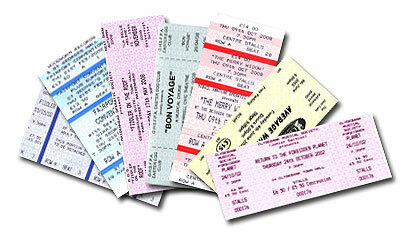 Use Tyvek and PVC Econobands as an effective non-transferable ticketing method. Sharp bright colours, Tyvek with tape or Econoband easily snap locked around all wrists. Elinate lost tickets. Efficient and paractical ticketing and crowd control ID bands. 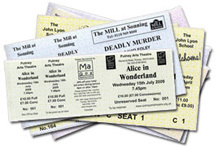 We specialise in all types of theatrical and event ticket printing & support services. Priding ourselves in offering our customers first class service at prices that will meet even the tightest of budgets. From theatrical organisations to major UK shows, school events to community fetes, pubs & social clubs to leisure services, we cater for all!. This site has been designed to be simple to use, and give you the maximum amount of information you need. Follow the user friendly questions to easily obtain details and options on what you need. You can even order samples on line, which will be with you in 48 hours. So go on, try us out, you'll wonder how you ever managed without us. 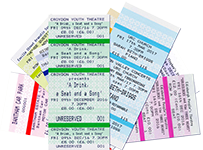 We offer an easy hassle free complete ticket design, print and delivery service as well as Draw Tickets, Roll tickets and Numbered Seat Label printing to your reserved seating plan. Bespoke sizes to maximum 100mm depth x 210mm width on request.